How do I deactivate my product? (use this if you have reached a maximum). 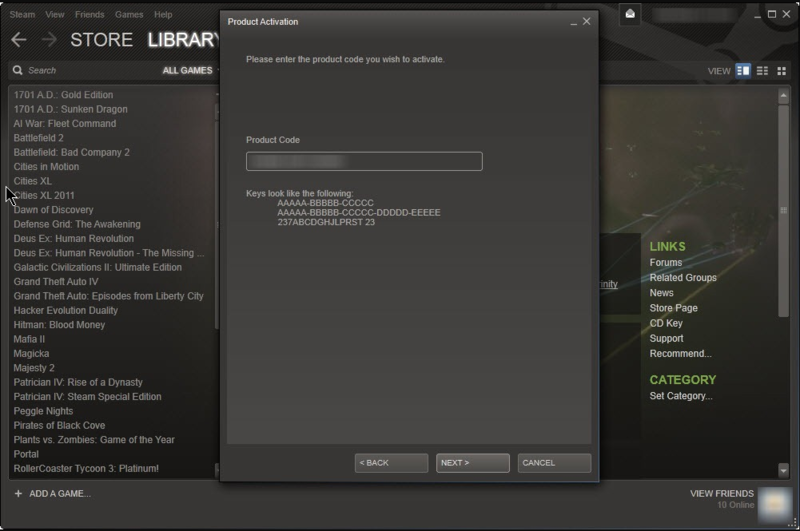 Why is my Steam version (purchased there) asking for a product key? 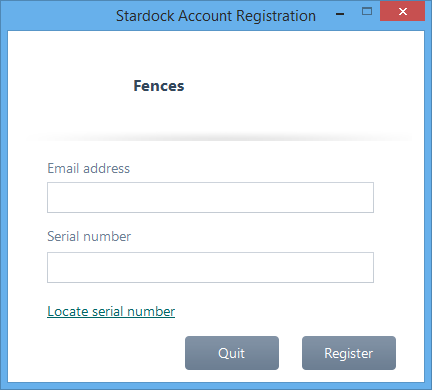 Even if you no longer have access to the email address you used to set up your account with Stardock, you can still use it to log in and change it here. You can use this site to change other account information as well. 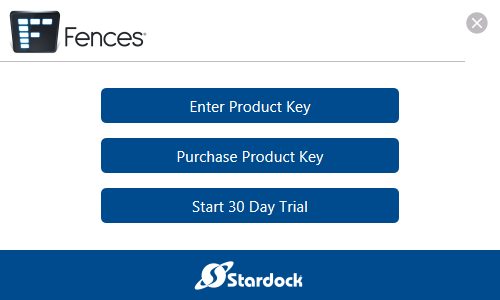 If you log in to the Stardock online store ( https://store.stardock.com/myaccount) and select "Order History" you can view order invoices, and refunds, for your account. The emailed receipt also has the complete information from your purchase. At checkout, there was a place to enter a VAT. Please note, if there are omissions or mistakes that you made while entering the data, we cannot alter an invoices after its creation. An Individual User may install, use and activate one (1) copy of the Software on up to five (5) unique personal computers simultaneously that are owned by you for your personal use. The lone exception is Multicity where it is (1) copy per Primary PC. A Business Entity (which includes commercial, not for profit or educational types) however, may Install and use one (1) copy of the Software on one (1) unique personal computer. For any product that was purchased from one of our software partners, you need to refer to your receipt to get your key. If you no longer have your receipt, you will need to contact the vendor directly. 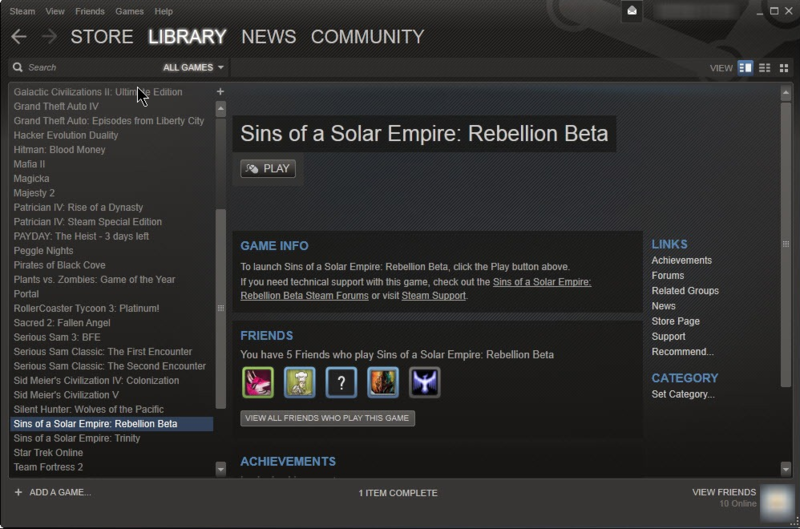 If the vendor provided you with a Steam key, please click here. The images in this example will show Fences but the dialogue and the procedure will look and be the same regardless of the product. If your activation method does not look like any of the images below, please go HERE. If you are not seeing a similar activation dialog below for your product, please reboot your machine. When the boot is complete, you will then see the activation dialog. If you see a different product, other than the one you purchased, you can uninstall it and you will no longer be prompted to activate that product. To activate, click the 'Enter Product Key' button. 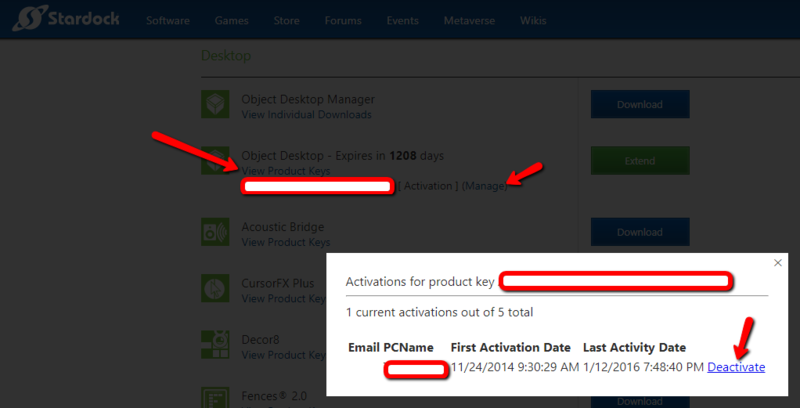 Enter in the product key you received and your email address and click 'Activate' to activate the product. If you do not have your product key, you can go HERE for instructions on how to retrieve it. 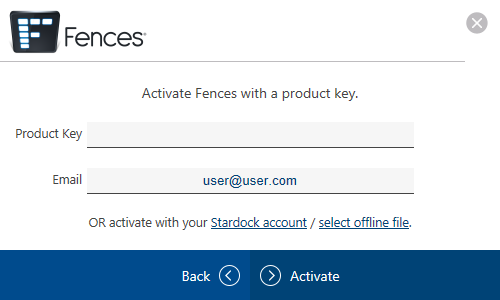 If you already have an account and have activated the product previously, you could click the option at the bottom to activate with your Stardock account credentials instead. 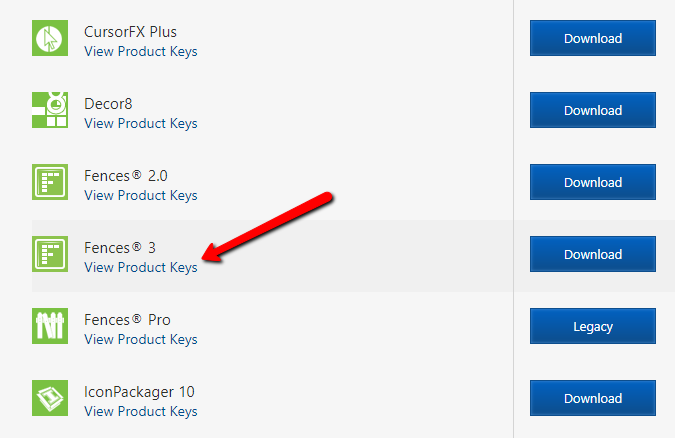 IMPORTANT NOTE: To avoid entering your product key incorrect, please copy the product key directly from your products page or receipt, and paste it directly into the "Product Key" field. The product key must appear EXACTLY like it does on your products page or receipt in order for activation to succeed. If the activation is successful, you will see a dialog stating so. 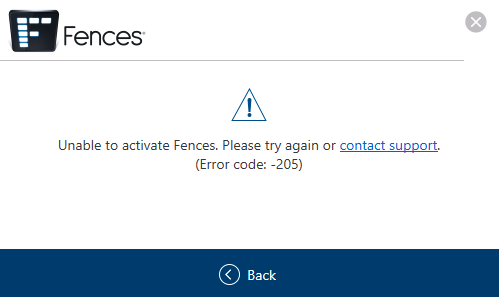 In this case, your Internet connection may be functioning but your ability to connect to the activation server may be blocked somehow. Click the 'Offline Activation' button to proceed. If your machine is able to access http://activate.stardock.com/ you can go there and upload the .req file which will give you a .resp file to save to your computer. You can then click the 'Select Activation Response' button to browse to where the .resp file is saved. This will complete the activation. 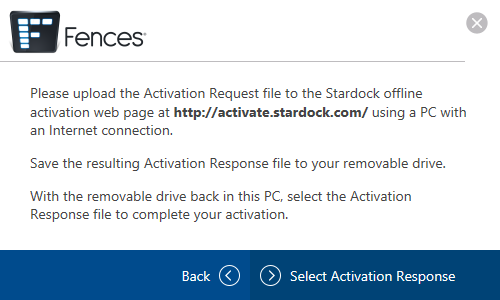 If you are not able to access http://activate.stardock.com/ from the machine you are activating on, you will need to bring the .req file to a machine that has internet and complete the process there and then bring the .resp back to the machine you wish to activate on. The .resp file can also be loaded using the 'select offline file' option as seen on the initial activation screen in the second image at the top of this webpage above. Note: The req file must be created the PC needing the activation, and the subsequent resp file can only be used to activate that PC, not any others. If the prompt for activation does not come up when launching the product, typically there will be an option to activate within the 'Help' section of the configuration menu for the application. Note that in this example Fences is used but the options will look the same for the other products. 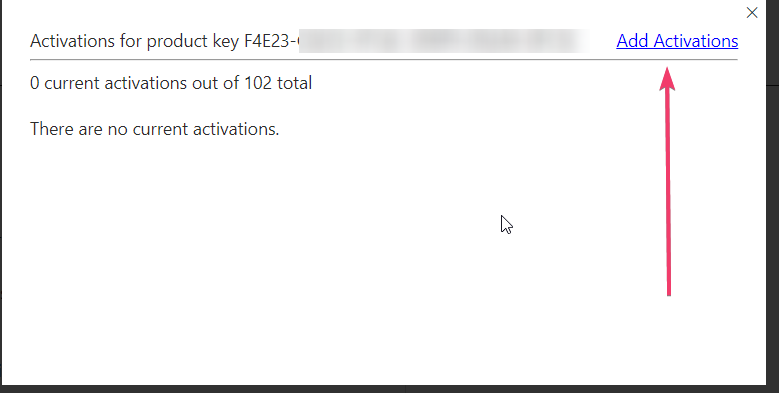 If your activation prompt does not look like anything below, please go HERE. 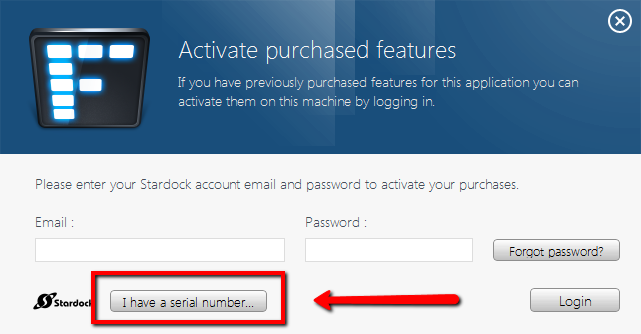 Select the "I have a serial number" button and fill in the form. Fill out the form. Note that the product key is the same thing as the serial number. If you are prompted for the off-line activation please go HERE for instructions. 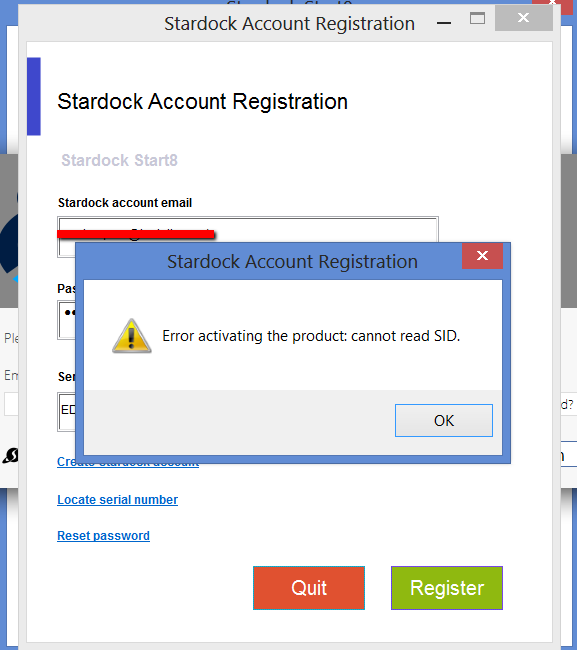 Then jump above where it says For Customers with a Stardock Account. 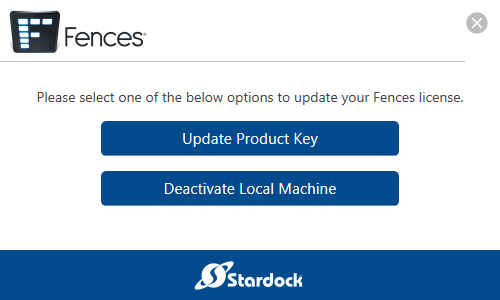 There may be times when you want to deactivate a Stardock product on one PC so you can activate it on another. 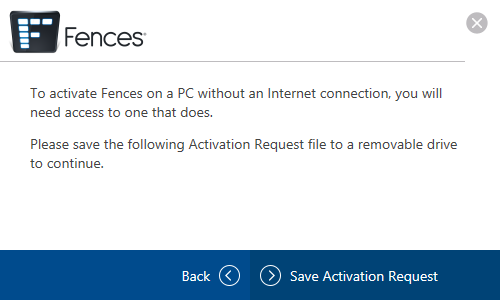 This method is especially useful if you had PC issues that prevented you from deactivating from within the app. Use the same email and whatever password you like. On the window that comes up, click the 'Deactivate Local Machine' button and then click 'Deactivate'. This will free the activation up so you can activate on another machine of your choosing. The 'Update Product Key' option would allow you to specify a new key to attempt the activation with. 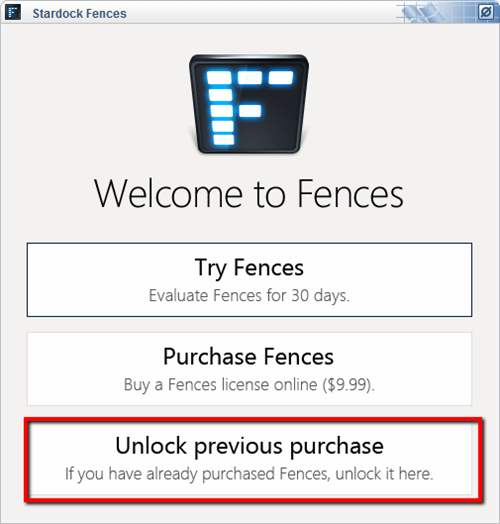 This would be applicable if another license was purchased and you wanted to activate with that product key. Running any app installer with a /s at the end will silently install. Furthermore, adding a /noreboot will not reboot the machine. The following command line will activate the application without exposing the UI. Ignore the AppName and hyphen and only copy and paste the quoted text. Note: If you are connected to a corporate VPN, please disconnect (if possible) before trying the methods below. 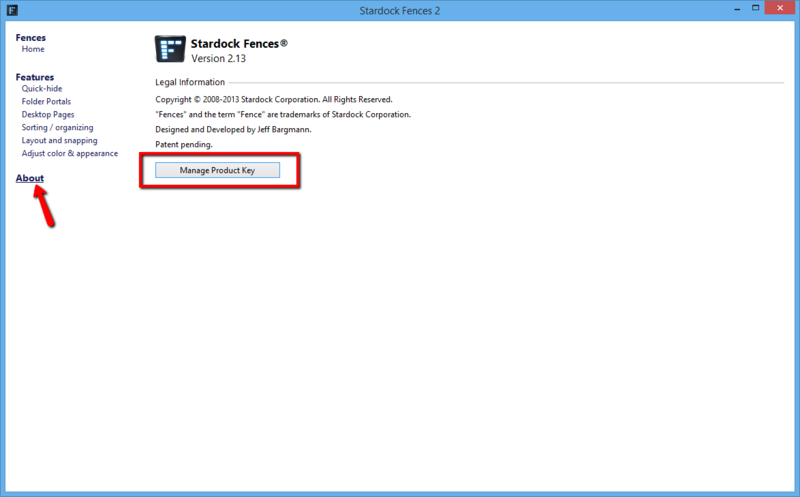 Note: The variable -company name ,"Stardock", needs to remain that, Stardock - do not change it to your company name. "C:\Program Files (x86)\Stardock\Groupy"\SASUpgrade.exe -prodId=2644 -prodName="Groupy" -company="Stardock" -ver="1.00" -email="USER@USER.COM" serial="PRODUCTKEYGOESHERE"
"C:\Program Files (x86)\Stardock\Start8"\SASUpgrade.exe -prodId=2267 -prodName="Start8" -company="Stardock" -ver="1.56" -email="USER@USER.COM" serial="PRODUCTKEYGOESHERE"
"C:\Program Files (x86)\Stardock\Start10"\SASUpgrade.exe -prodId=2623 -prodName="Start10" -company="Stardock" -ver="1.08" -email="USER@USER.COM" serial="PRODUCTKEYGOESHERE"
"C:\Program Files (x86)\Stardock\Fences"\SASUpgrade.exe -prodId=2240 -prodName="Fences2" -company="Stardock" -ver="2.13" -email="USER@USER.COM" serial="PRODUCTKEYGOESHERE"
"C:\Program Files (x86)\Stardock\Fences"\SASUpgrade.exe -prodId=2628 -prodName="Fences3" -company="Stardock" -ver="3.00" -email="USER@USER.COM" serial="PRODUCTKEYGOESHERE"
"C:\Program Files (x86)\Stardock\WindowBlinds"\SASUpgrade.exe -prodId=2272 -prodName="WindowBlinds" -company="Stardock" -ver="8.12" -email="USER@USER.COM" serial="PRODUCTKEYGOESHERE"
"C:\Program Files (x86)\Stardock\WindowBlinds"\SASUpgrade.exe -prodId=2630 -prodName="WindowBlinds" -company="Stardock" -ver="10.0.2" -email="USER@USER.COM" serial="PRODUCTKEYGOESHERE"
"C:\Program Files (x86)\Stardock\ModernMix"\SASUpgrade.exe -prodId=2271 -prodName="ModernMix" -company="Stardock" -ver="1.22" -email="USER@USER.COM" serial="PRODUCTKEYGOESHERE"
"C:\Program Files (x86)\Stardock\DeskScapes8"\SASUpgrade.exe -prodId=2268 -prodName="DeskScapes" -company="Stardock" -ver="8.50" -email="USER@USER.COM" serial="PRODUCTKEYGOESHERE"
"C:\Program Files (x86)\Stardock\Tiles"\SASUpgrade.exe -prodId=1942 -prodName="Tiles" -company="Stardock" -ver="1.20" -email="USER@USER.COM" serial="PRODUCTKEYGOESHERE"
"C:\Program Files (x86)\Stardock\WindowFX"\SASUpgrade.exe -prodId=2245 -prodName="WindowFX" -company="Stardock" -ver="6.00" -email="USER@USER.COM" serial="PRODUCTKEYGOESHERE"
"C:\Program Files (x86)\Stardock\ObjectDock"\SASUpgrade.exe -prodId=1169 -prodName="ObjectDock" -company="Stardock" -ver="2.20" -email="USER@USER.COM" serial="PRODUCTKEYGOESHERE"
"C:\Program Files (x86)\Stardock\Launch8"\SASUpgrade.exe -prodId=2276 -prodName="Launch8" -company="Stardock" -ver="1.06" -email="USER@USER.COM" serial="PRODUCTKEYGOESHERE"
"C:\Program Files (x86)\Stardock\Multiplicity"\SASUpgrade.exe -prodId=2283 -prodName="Multiplicity" -company="Stardock" -ver="3.42" -email="USER@USER.COM" serial="PRODUCTKEYGOESHERE"
The following command line will activate the application without exposing the UI. Simply copy and paste the applicable line below into the cmd window and deactivation will occur silently. "C:\Program Files (x86)\Stardock\Groupy\SdDisplay.exe" -deactivate -prodID=2644-prodName="Groupy" -company="Stardock" -prodVer="1.00"
"C:\Program Files (x86)\Stardock\Start8\SdDisplay.exe" -deactivate -prodID=2267 -prodName="Start8" -company="Stardock" -prodVer="1.56"
"C:\Program Files (x86)\Stardock\Start10\SdDisplay.exe" -deactivate -prodID=2623 -prodName="Start10" -company="Stardock" -prodVer="1.08"
"C:\Program Files (x86)\Stardock\Fences\SdDisplay.exe" -deactivate -prodID=2240 -prodName="Fences2" -company="Stardock" -prodVer="2.13"
"C:\Program Files (x86)\Stardock\Fences3\SdDisplay.exe" -deactivate -prodID=2628 -prodName="Fences3" -company="Stardock" -prodVer="2.90"
"C:\Program Files (x86)\Stardock\WindowBlinds\SdDisplay.exe" -deactivate -prodID=2272 -prodName="WindowBlinds" -company="Stardock" -prodVer="8.12"
"C:\Program Files (x86)\Stardock\WindowBlinds\SdDisplay.exe" -deactivate -prodID=2630 -prodName="WindowBlinds" -company="Stardock" -prodVer="10.0.2"
"C:\Program Files (x86)\Stardock\ModernMix\SdDisplay.exe" -deactivate -prodID=2271 -prodName="ModernMix" -company="Stardock" -prodVer="1.20"
"C:\Program Files (x86)\Stardock\DeskScapes\SdDisplay.exe" -deactivate -prodID=2268 -prodName="DeskScapes" -company="Stardock" -prodVer="8.50"
"C:\Program Files (x86)\Stardock\Tiles\SdDisplay.exe" -deactivate -prodID=1942 -prodName="Tiles" -company="Stardock" -prodVer="1.20"
"C:\Program Files (x86)\Stardock\WindowFX\SdDisplay.exe" -deactivate -prodId=2245 -prodName="WindowFX" -company="Stardock" -ver="6.00"
"C:\Program Files (x86)\Stardock\ObjectDock\SdDisplay.exe" -deactivate -prodId=1169 -prodName="ObjectDock" -company="Stardock" -ver="2.20"
"C:\Program Files (x86)\Stardock\Launch8\SdDisplay.exe" -deactivate -prodId=2276 -prodName="Launch8" -company="Stardock" -ver="1.06"
Please note, the above commands are for the current versions of our software. If you are using an older version of the software, or a newer beta release, you will need to replace the the value in the -prodVer argument with the correct version. If you purchased a game / DLC from us, purchased from one of our software partners, or received a gift key for registering, and you need to redeem it within Steam, please read on. 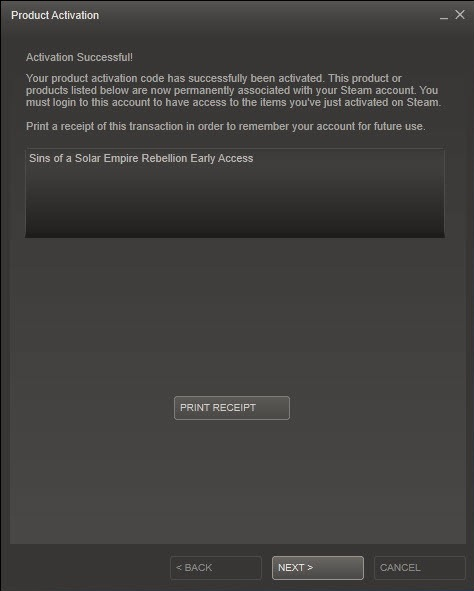 For any Steam product that was purchased from one of our software partners, you need to refer to your receipt to get your key. If you no longer have your receipt, you will need to contact the vendor directly. Next you have a new window with a couple of screens with agreements, instructions, etc. You will then be prompted to enter your key. After that, you will get confirmation and install info screens. That’s just about it. 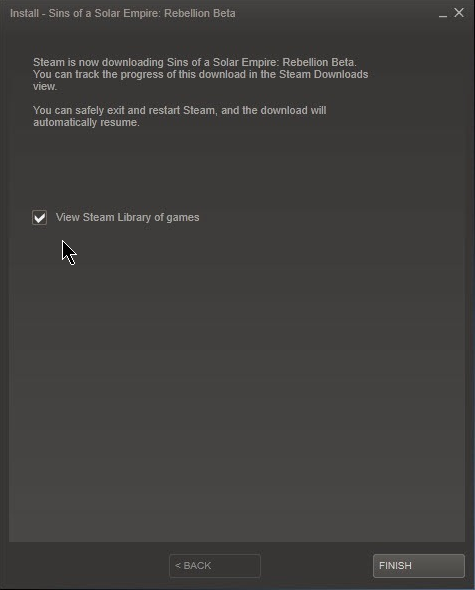 You can click the downloading area at the bottom of Steam to open up your downloads, and you can also view them from your Steam library. 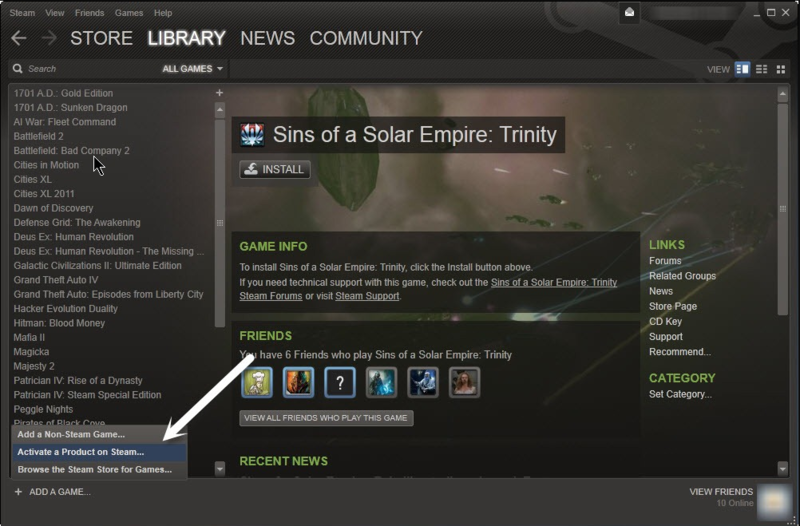 If your game / software is already in your Steam library, you do not need to do this. -In the install directory of the product in question, run sassteam.exe and see if you are able to use the product again. -If you have your mail forwarded from another web based account (hotmail, gmail), check that other account directly as well as its spam \ junk folder. -If you have an alternate email, please try using it instead. 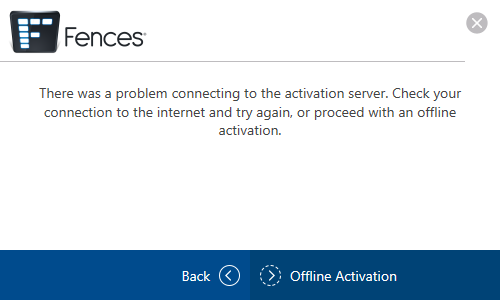 For problems with activation pertaining to a trial version, unfortunately, we do not currently have have an offline activation system in place. In lieu of being able to experience the trial, if you purchase the product (which does have an offline activation method), and it does not meet your needs, we will refund it. You may see this if you have the older style of activation. You may see this with the newer style of activation. This can happen when your computer name has non Western characters or symbols in it. To avoid this, you would need to change the name of your computer so that it contains only Western characters and then try to activate again. Once activated, you could change the name back if you wish. Please use the same fix for 'Error 212' in this FAQ to solve the issue. In the folder that pops up, you should see a folder named PRODUCTNAME. Please delete this folder and all of its contents. Note, the latter will not work for the trial - only for the paid version of the product.